Guest Instruments--a Spiritual Analogy for "If I Listen With My Heart"
Does your ward have a few people who can play different instruments? I had a couple guests come into Primary to play their instruments for the children, and we played a guessing game to see if they could identify each one by sound only. Reach out to a few instrumentalists in your area. Most musicians are thrilled at the chance to share their talents in Primary! I arranged for flute, guitar, and glockenspiel (the metal xylophone-like instrument pictured at right). Give them the sheet music for the song "If I Listen With My Heart," found here. Ask them to prepare to play the melody of only the last, repeated line, "And if I listen with my heart I hear the Savior's voice." I also asked my pianist to prepare to play the same line. Sing the first line of verse 3 of "If I Listen With My Heart": "I feel the Holy Spirit as He teaches truth and right," and pause. "Boys and girls, did you know that everyone feels the Holy Ghost a little bit differently?" Explain briefly that although the Spirit teaches the same truth about Jesus, people feel it in different ways. You could give some examples of ways you feel the Holy Ghost. "That's why we need to listen with our hearts." Sing, "And if I listen with my heart, I hear the Savior's voice." Tell the children that you're going to help them understand how the same message could be shared in different ways. They will hear different instruments play the same bit of song, but each instrument sounds a little different from the others. Challenge them to pay close attention the first time through, as you will quiz them afterwards! One at a time, ask the guest musicians to play their line of the song. In between each one, either cue the children to join with you in singing the same line, or make comments such as, "Could you hear how this time, the music was higher? But it's the same song, isn't it?!" Once each instrument has been played, grin and tell the children it's time to see how well they listened. Ask the children to close their eyes and see if they can hear which instrument is being played. Silently point to one musician, so he can play his line. Invite the children to open their eyes, and then take their guesses. You'll be surprised by how well they listen! Give each musician a time to play for the children again. As you finish, remind the children that just as they had to listen so carefully to hear the difference in the instruments, they also have to listen carefully with their hearts to hear the Holy Spirit speak to them. I can think of no better skill for us to teach our children. Looking for more? For another thought-based activity, try Nature Daydream, here. Superlative alert: this is my all-time favorite Primary music activity. Ever. Probably because it's my kids' favorite activity, too. :) The base idea I got from Sharla over at TeachingPrimaryMusic.com, and I just tweaked it a bit. I dare you to give this a try, and see if your kids don't beg you for more when Singing Time ends! Ask each family in your Primary for a family picture. My Primary secretary quite handily sent out a group email for me. The families emailed me their pictures, and I printed them out on cardstock. Yes, this takes quite a bit of colored ink, but these pictures can be used over and over, so I was okay with the cost. The odds of your receiving a picture for every family are kind of slim. You could send out personal emails a few days afterwards, or you could just use the photos you received. If you're ambitious, you could even arrange a time at church to snap photos of the remaining families. Tell the children you're going to play a game. Ask them to pretend they have cameras inside their heads, and you want them to take an inside photo of the picture that you will hold up. Tell the children to memorize the picture as much as they can because you're going to hide it and then quiz them on details. Hold up the first family picture and start singing your Mother's Day song of choice. This year, we're learning "I Often Go Walking," but this works equally as well with any family-focused song. (I do this activity for Father's Day, as well!) Sing the song through once. You'll probably be singing a solo, but that's okay, since the kids will be learning as they hear the song repeatedly. As I sing, I walk across the front of the room slowly, giving all the children a closer view. I pointedly bring the picture close to whichever child is in that family, to make sure he notices. After singing the song once, hide the picture and ask 2 or 3 questions. Some good example questions are "How many girls are in this family?" or "How many people are wearing glasses?" You can base questions off of the individual pictures. For each picture, the last question I always ask is directly to the child in the picture, and it is, "What is special about this mom?" Helpful Hint: Mother's Day and Father's Day can be tough for some kids. 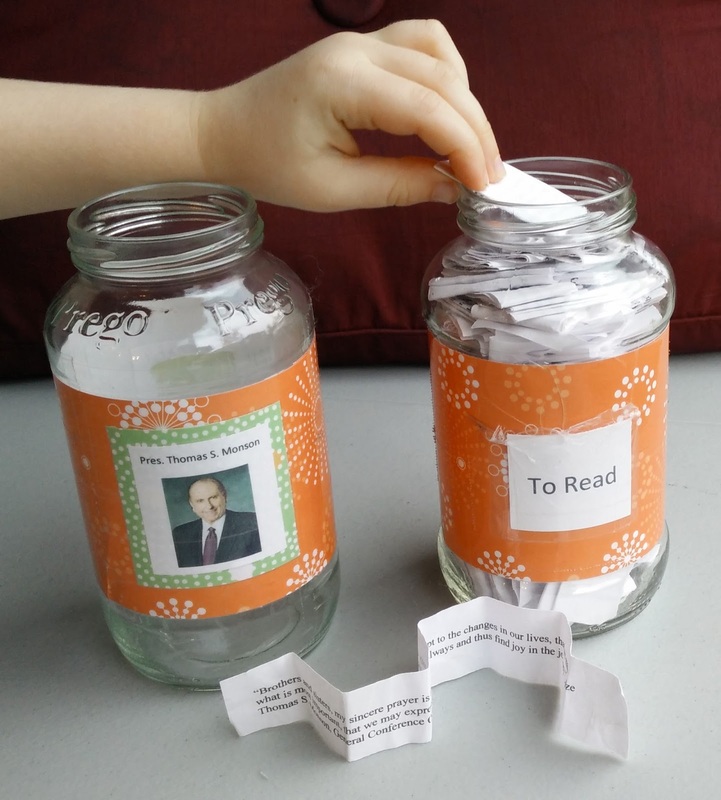 See my blog post here about special needs Primaries, with a section about children who have special needs when being taught the doctrine of families. 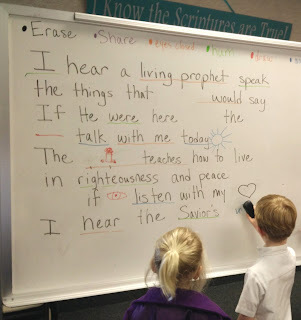 White Board Colors--An Older Child Activity for Verse 2 of "If I Listen With My Heart"
I always worry a little bit when preparing to teach wordy songs with several verses. 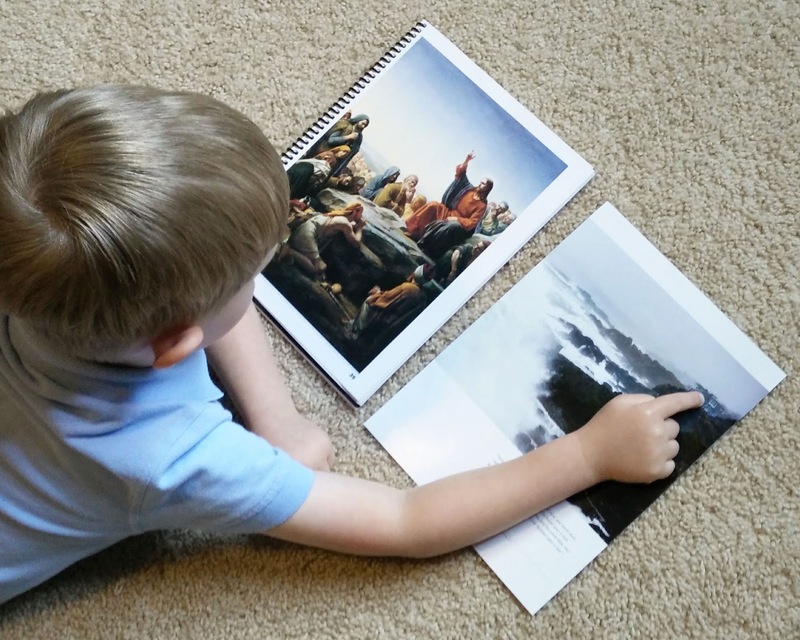 I want to be sure to give my children different experiences learning the different verses, so they can have separate and distinct memories associated with the words. After working on verse 1 of "If I Listen With My Heart" with my kids for a few weeks, they knew it pretty well. So, I decided to introduce verse 2 with White Board Colors, an activity I borrowed from Elise over on the Facebook Choristers group. (Love that place!) 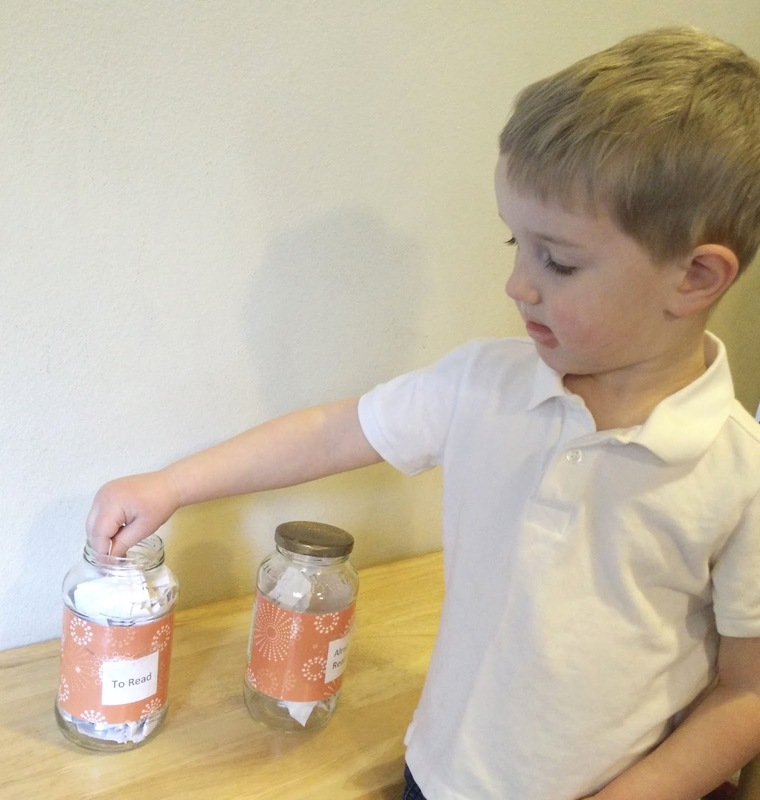 This activity does well for a first introduction to a verse, since the children are encouraged to interact with the song in a number of different ways. Eyes closed=using your marker, underline a word or phrase on the board. The entire Primary will then close their eyes during that phrase every time. After the instructions, immediately launch into singing. Walk around the room, offering the bag to various children to choose a marker. I normally pass out about 3 at a time, and then I wait for space to open up at the board before passing out more markers. Ideally, you'll be singing constantly, only pausing when a child draws the Share marker. I find that it's helpful to stop every so often, though, to encourage a child who's confused about the instructions, or to clarify the sign that a child chose. The variety of the activities allows you to repeat this song over and over without feeling stale. I sang this verse repeatedly for ten minutes, until we finally ran out of time. The kids never did lose interest! Looking for more? Even a great activity like this one shouldn't last your full 20 minutes. Take a look here for a complete Singing Time plan that includes White Board Colors, as well as a couple contrasting activities. Primary songs stick with you throughout your life. They become part of who you are. Instead of telling the children this (they'd probably forget it anyway! ), I'm planning an activity that will show them. This Sunday I'm combining a few ideas I've seen and having a Teacher Appreciation Day, where I highlight the teachers and their favorite Primary songs. My hope is that the children will not only get to know a little more about their teachers, but that they'll also feel how special these particular songs and their meanings are. Over the past couple weeks, I've contacted all the Primary teachers and leaders. I asked for their favorite Primary song and an emailed picture of their family. 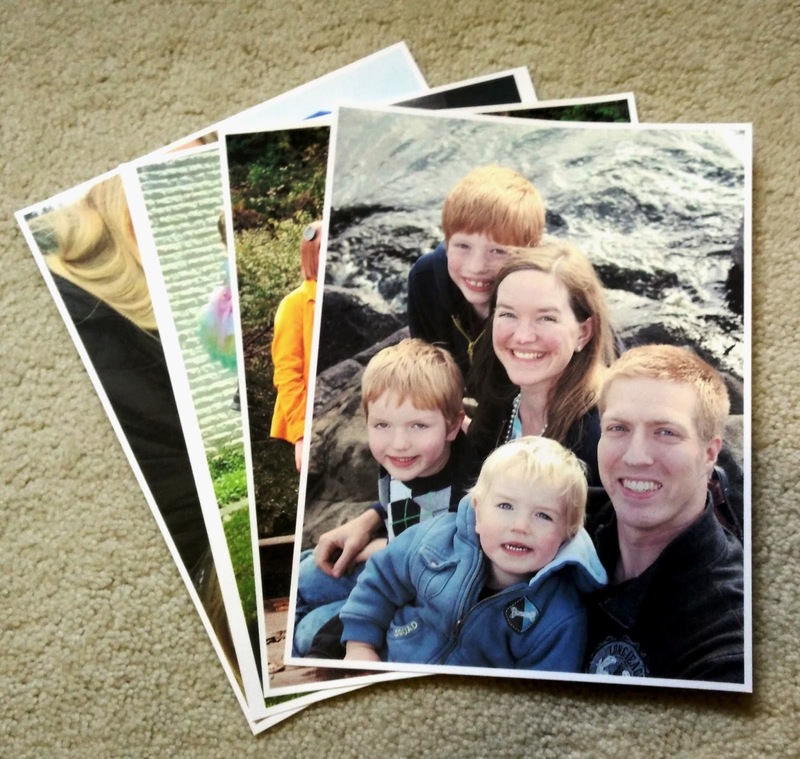 Then I printed out their family pictures on cardstock. * -Hearing why it's the teacher's favorite song could be either a spiritual or a word-focused activity, depending on the comments. * -Inside Camera is a visual activity. The children will undoubtedly start to feel wiggly sometime in the middle. When that happens, I'll pause the Inside Camera game and sing "Fun to Do" (Children's Songbook p.253), using teachers' favorite hobbies. * -Using actions for "Fun to Do" is a physical activity. Have you highlighted your teachers in Singing Time? What ideas have worked for you? When I first participated in this activity in a Primary music workshop by Sharla Dance, I knew I had to provide the opportunity to my Primary children. I don't use this activity often, so that it doesn't become commonplace, but each time I've presented Sing a Story, I've felt the Spirit intensely. The idea is simple: you tell a story that demonstrates the principle found in your song, and you intersperse lines of that song, singing a cappella by yourself. The result is an opportunity for the Holy Ghost to powerfully testify of that principle's truthfulness. Once, I sang "I Stand All Amazed" (Hymns #193) with the story of a boy whose dad was in jail, learning about God's love. Another time, I sang "Help Me, Dear Father" (p.99) about my own experience learning how to forgive my dad after I was angry with him. Choosing a word strip for Sing a Story. When I tell the story with an animated voice, the kids are drawn in. I admit that I have to practice a lot, in order to tell the story without looking at any notes! When I've prepared well, and when I've prayed for help to present the story in the best way, it is always a beautiful experience.